Will Morey, CEO of Morey's Piers in Wildwood, completed a very successful year as Chairman of the International Association of Amusement Parks and Attractions. 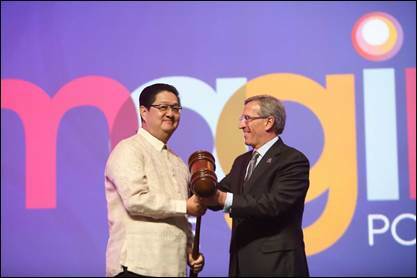 On November 19, Will Morey passed on the International Association of Amusement Parks and Attractions (IAAPA) chairmanship gavel to Mario Mamon, (chairman and president of Enchanted Kingdom in the Philippines) during the IAAPA Attractions Expo 2013 in Orlando, FL, closing a milestone year for both the president and CEO of Morey’s Piers and the amusement industry association. 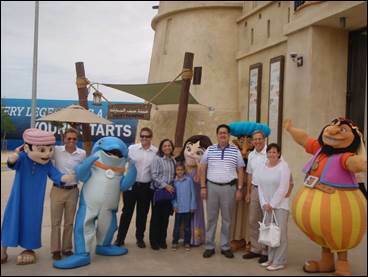 When taking the reigns as chairman of IAAPA in late 2012, Morey kicked off an aggressive 2013 member visit “around the world in 100 days” campaign, and by the end of his tenure became the first IAAPA chairman to visit more than 100 amusement parks, facilities, industry manufacturers and attractions around the world. Traveling to 11 countries, Morey’s visits ranged from Ski Dubai (the Middle East’s famous indoor ski facility) and Resorts World in Singapore, to Puy du Fou and Futuroscope parks in France, as well as parks in Germany, Chile, Brazil, Phillipines, Indonesia, Colombia, and several other domestic attractions across North America including smaller, family owned and operated facilities. For the first time in IAAPA’s nearly 100 year history, an International IAAPA Board of Directors meeting was held in New Jersey in June, bringing heightened awareness of the re-emerging Jersey Shore during a crucial recovery period post Hurricane Sandy. 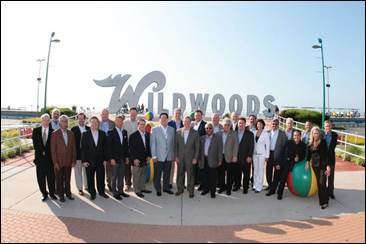 The four-day summit hosted by Morey brought nearly 30 of the amusement park industry’s top leaders from 14 nations around the globe to Morey’s Piers in the Wildwoods, NJ for executive meetings, site tours and visits along the Jersey coastline. The meeting was also the site of the Board’s approval of the association’s new Global Governance Plan, the effort of a task force chaired by Morey. Morey used his chairmanship as an opportunity to bring amplified advocacy and recovery efforts to the member attractions up the eastern seaboard. 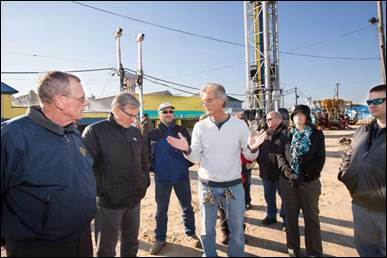 While Morey’s Piers was mercifully spared Sandy’s wrath, having Morey on the ground in the heart of the troubled zone proved helpful to members in the affected areas, as Morey led tours that brought IAAPA executives to parks impacted by the hurricane, such as Coney Island, Keansburg and Point Pleasant. These fact finding visits served to determine what assistance and services the parks required for their rebuilding efforts. As part of the post-storm meetings, IAAPA worked with state and federal officials to help ensure local operators were provided assistance in a timely manner. More than 25 team members from Morey’s Piers attended the IAAPA Attractions Expo 2013 in Orlando, FL from November 18-22, 2013, to gather information on the newest amusement park trends and technologies and get a first look at new products to keep the company competitive in the industry. During the highly attended, five-day conference, Morey and his brother and business partner, Jack Morey, hosted a seminar entitled “The Power of Yin & Yang,” outlining the successes and challenges of their business model and how two brothers with opposite work styles operate the well-known Morey’s Piers, which spans more than 18 acres including three amusement piers and two waterparks, and employs over 1,500 people during the summer. Also at the Expo, Morey’s Piers finalized a much anticipated contract with Zierer, Germany-based amusement ride manufacturer on a new ride that will debut on Mariner’s Landing Pier in summer 2014. As IAAPA chairman, Morey represented the industry’s leading trade association with more than 4,500 facility, supplier and individual members from 97 countries. By latest estimates, revenues for the global theme park industry are $24 billion with attendance numbers exceeding 770 million. The market in the US comprises roughly half of that with annual revenues of $12 billion and attendance of 300 million. The International Association of Amusement Parks and Attractions (IAAPA) is the premier trade association for the attractions industry worldwide. Founded in 1918, IAAPA is the largest international trade association for permanently situated amusement facilities and attractions and is dedicated to the preservation and prosperity of the attractions industry. IAAPA represents more than 4,500 facility, supplier, and individual members from more than 90 countries. Member facilities include amusement/theme parks, water parks, attractions, family entertainment centers, zoos, aquariums, museums, science centers, resorts, and casinos. IAAPA is a nonprofit organization. Revenue generated for the association by its involvement in trade shows and other activities are returned to the association to fund services for its members and the industry. The association’s global headquarters is in Alexandria, Virginia, United States. The association maintains regional offices in Brussels, Mexico City, and Hong Kong. Visit www.IAAPA.org.